Complete solar solutions for homes and businesses. Don't take our word for it. Watch what our customers are saying about us. 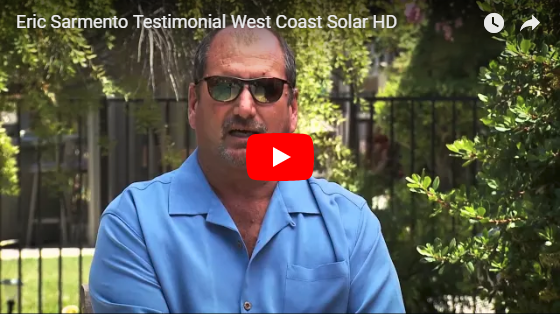 Since 2007, West Coast Solar has helped property owners across Northern California save big on utility expenses with solar energy. We provide the highest quality products, excellent customer service, and the most competitive pricing on the market. Our team of highly-trained and certified solar panel and smart home installers works only with the industry’s best manufacturers, suppliers, and financing partners, allowing us to get you the best product and service in the area. At West Coast Solar, we make solar simple! There are many reasons why our customers tap the sun to power their homes or businesses. Many want to save money for years to come. Others want to lower or even eliminate their dependence on fossil fuels. Learn more about switching to solar here! We work with you to find the ideal ownership arrangement and financing choices to best reach your financial goals. With a variety of programs available to serve your needs, our primary goal is to find the best solutions for each homeowner. Whether your stay tied into the utility grid or you go completely off-grid, your solar power use can benefit from a home battery to use as a backup or to store unused energy for later. At West Coast Solar we make solar simple. We'll create the right solution for your home or business.